This post is part two in a three part series on cabinets. You can read How Do I Pick Cabinets? Part 1: Doors here. 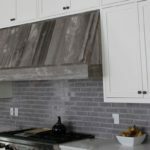 It’s hard to imagine it being too difficult to pick the right cabinets for your kitchen or bathroom remodel, but there is actually a lot to consider. There’s so much to consider, in fact, that this discussion is being delivered to you in three separate parts. The previous post discussed cabinet door design. This part will discuss the more boring, but actually most important, topic of cabinet selection: cabinet construction. The focal point in any kitchen remodel is the cabinets. Because cabinets are so noticeable and costly, it’s important to make the right cabinet decision to suit your needs. You want something that’s beautiful but you also want something that’s going to last and serve you and your family for as long as you remain in your home. To make this decision easier, you’ll need to consider a few questions. How do you use your cabinets? What is your budget? What quality level do you desire? How long do you expect your cabinets to last? Do you intend to remain in your home long term? 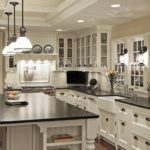 The answers to these questions will help you determine which cabinet construction is best suited for your remodel project. Cabinets are constructed using three types of material: plywood, MDF (medium density fiberboard), and structural particle board. Each has its benefits and its drawbacks. Plywood is composed of thin layers of wood veneer that are layered and glued in an alternating grain pattern. This alternating pattern gives plywood a rigid strength. Plywood is resistant to splitting when nailed, and expansion and shrinkage due to high or low humidity. 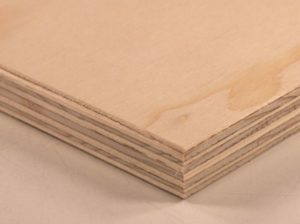 Plywood is available in multiple grades with cabinets being made of a high-grade plywood known as stain grade or cabinet grade. Cabinet grade plywood is sanded to a fine finish to allow for the best surface for painting and staining. Advantages: Plywood is a very strong product and well suited for use in cabinetry where long life is expected. Plywood cabinets come stained or painted, and can later be sanded down and refinished to update their look. Plywood is less susceptible to water damage which makes it perfect for the bathroom and kitchen. Plywood cabinets are also quite strong so they’re ideal for holding heavy countertops like quartz, concrete or granite. The alternating grain also makes plywood the best medium for holding screws. Disadvantages: Plywood is more expensive than both particle board and MDF constructed cabinets. You can expect to pay as much as 10-20% more for plywood cabinets. Plywood is also quite heavy, so installation is not a one-person job. MDF is constructed from broken down hardwood and softwood particles combined with a resin binder, which is then applied to high heat and pressure. It can be used for many construction projects ranging from cabinets to furniture. MDF cabinets are usually painted with a heat-treated paint compound that provides high durability. Wood tones are not possible unless a wood veneer or laminate is applied. 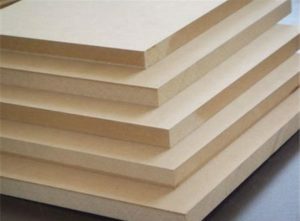 Advantages: MDF products are denser and stronger than particle board. In the right conditions, MDF cabinetry can last a few years. MDF is more economical than plywood, which can make a kitchen or bath remodel more affordable. The smooth surface on MDF makes it great for painting and the perfect surface for applying a veneer, so refinishing the cabinets could be an easy task. Disadvantages: Because of MDF’s density, MDF cabinets are very heavy. Extra bracing and helping hands will be needed to hang MDF cabinets. If you choose to select MDF cabinets, it’s best installation be left to the professionals. MDF also doesn’t hold screws very well so without proper care as the years go on, hinges can be pulled out. MDF is also very absorbent and will absorb liquids like a sponge if not properly sealed. There is also the risk of VOC exposure with MDF. 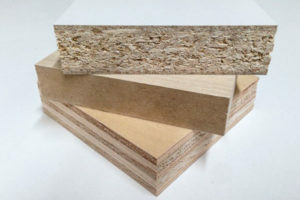 Particle board is composed of wood chips, sawmill shavings, and sawdust mixed with a synthetic resin or other binder, which is then pressed into sheets under high pressure. Particle board is an economical wood product and typically finished with paint, wood veneer or laminate. There are varying qualities of particle board based on the size of the wood materials used to produce it. It’s important to ensure a high quality particle board is being used when building cabinets. Advantages: Particle board cabinets are the most inexpensive option of the three discussed here. 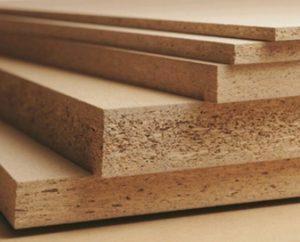 High quality particle board can be quite strong and less likely to warp than plywood. Particle board is also lighter than both MDF and plywood, but because of its properties, it’s best to leave installation of particle board cabinets to the pros. Disadvantages: Particle board is susceptible to water damage. When it gets wet and swells, the structural integrity of the cabinetry is compromised. Particle board, like MDF, does not hold screws well. Particle board may also be more susceptible to dents and scratches than other building materials because of its soft nature. 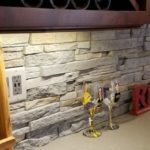 If the budget is the focus of your remodel or if you’re planning to renovate the space again in the future, particle board or MDF may be your best choice. However, if you’re looking for longevity from your kitchen, you’ll be best to choose plywood construction because plywood is more likely to stand the tests of time. Now that we have the materials out of the way, let’s look at how cabinets are constructed. Face framed cabinets are built with rails and stiles. The stile is the vertical piece of wood in the center of the cabinet opening and the rails are the vertical pieces of wood found on either side of the cabinet opening. 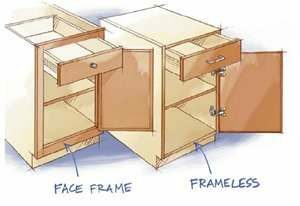 In face framed cabinetry, a 1 ½” to 2” face frame is built to provide strength, hide the edges of the building materials, and for mounting cabinet doors. 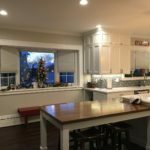 Framed cabinets can accommodate full overlay, partial overlay, or inset style doors providing you with many possibilities for creating a customized look to your kitchen. Frameless cabinets are built, as the name would suggest, without frames. Frameless cabinets allow for easier storage of larger items. When choosing a frameless cabinet, it’s important to note that only full overly doors are an option, which can provide a clean and simple design that is aesthetically pleasing to those seeking a minimalist design. Frameless cabinets also provide for larger drawer options with no frame to build around. The cost of frameless cabinetry varies depending on the complexity of the cabinet design (inset doors vs full overlay, for instance). 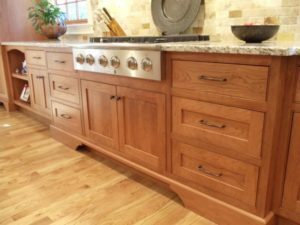 If you’re looking for an old-world or traditional feel to your space or if you prefer to have more cabinet door options, face framed cabinetry might be the best option for you. If easy access and maximum storage capabilities are your primary focuses, then frameless cabinets might be the way to go. Regardless of your style preferences, construction matters. Knowing the difference between the different construction materials and frame types will put you at an advantage for making the best decisions for your remodel needs. 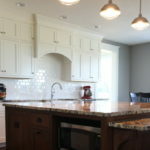 Cabinets are the most expensive aspect of a kitchen remodel. It’s important to get the best quality that your budget can handle so you can be sure to enjoy your new kitchen for many years to come. When you’re ready to take the next steps in your remodel project, call Moose Ridge Design-Build Construction at 563-260-9282. Our personalized attention to your project will provide you with the tools you need to make the most informed decision keeping your wishes and budget in mind.